Morrisons are filling up their basket with new products and services: but will this be enough to continue to cash in at the checkout? Last week Morrisons celebrated the fruits of their labour over the past few years, announcing a 3.4% increase in sales for the first quarter of this year. Under the Chief Exec David Potts, Morrisons has gone through a period of huge change, investment and overhaul, and have been rewarded with the best quarter for the business since 2009. They have recently introduced a series of new product ranges designed to offer a wider range of products to a wider range of consumers. These include a new ‘Best’ premium range, focused on more affluent shoppers, the Nutmeg clothing range to rival Tesco’s F&F and Sainsbury’s TU brands, a new online flower offer flowerworld.co.uk which sells fresh bouquets with free delivery and a new ‘food to order’ service which allows customers to order party food to be collected in store. These new products show how Morrisons is widening their appeal, adding to an already wide portfolio of products and services including a pharmacy, dry cleaning, cafes and petrol stations. All whilst launching the re-worked Morrisons Daily brand, the convenience store format which was started last year after selling the MLocal portfolio. 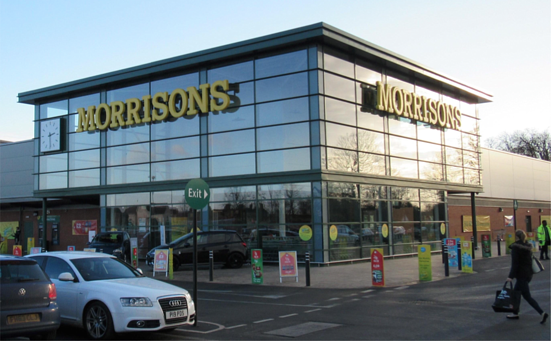 Morrisons have already secured a deal to open Daily stores across the Rontec forecourt network, and according to Rontec’s Chairman and Chief Executive, Gerald Ronson, has potential for around 100 stores within their forecourts. Morrisons also announced last year that they will re-launch the Safeway brand as a wholesale provider to independent convenience stores across the UK. What is interesting to see in this period of success, that there is very little change in their supermarket store numbers. In fact, in the past 12 months, the only activity in terms of openings and closures is one closure in a shopping centre in London. All improvement in sales has therefore come from improvements within its current store portfolio. 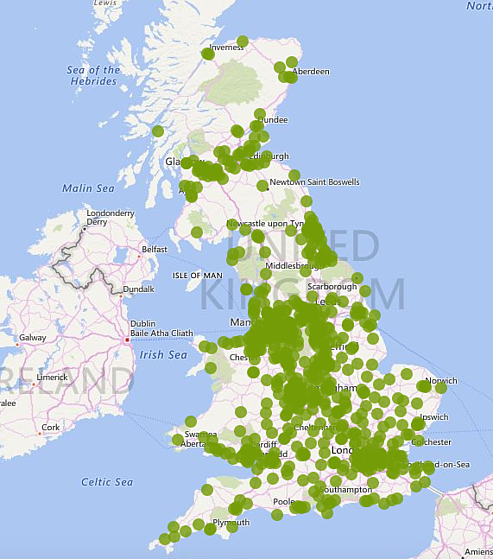 If we look at Morrison’s estate of stores using LDC’s location insight platform, we can see that the majority (70%) are in standalone retail locations (which is not surprising for a supermarket chain) and that there is a fairly wide coverage across GB. From Figure 1 we can see that the coverage of the Morrisons estate looks pretty healthy, and for what was once a brand synonymous for its Northern coverage, Morrisons do have a coverage of stores in the South, especially around Greater London, even if there are two noticeable clear spots above Newcastle and in the East of the country. One thing Morrisons have got right with their locations is the density of competitors. The supermarket industry is becoming more and more competitive, with shoppers losing loyalty in times where increasing prices can often can send customers across the road to a neighbouring supermarket. If we now take one of Morrison’s main competitors, Aldi, and pull a store map, we have quite a similar looking map, just with a higher density of coverage. Similar clusters can be seen around Manchester and Birmingham, and similar gaps can be seen above Newcastle, but with a better coverage in the East. 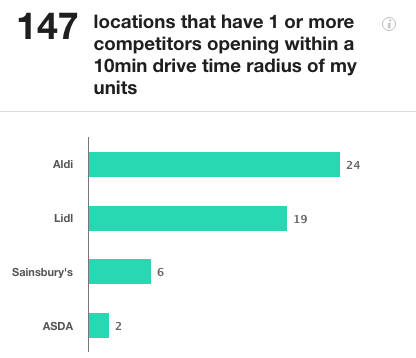 When we look more closely at Morrisons' competitors that have opened within a 10-minute drive time of one of their stores, we can see that Aldi really are hot on their heels, with 24 stores having opened within the last 12 months alone. Of these and Aldi’s other new openings over the past 12 months, our data shows that these are fairly spread out, but the largest increases being: three new stores opening in the South West, two opening in the South East and three opening in the West Midlands, plugging gaps in Aldi’s coverage. 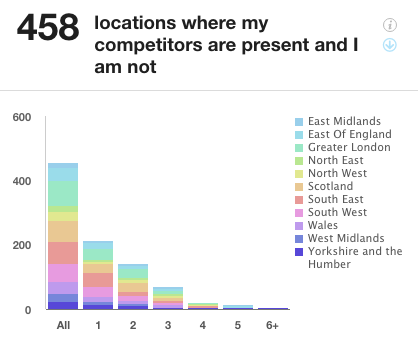 Flipping this on its head, however, we can see that there are plenty of locations (458 to be exact), spanning across GB, but more noticeably in Greater London, the South East and West and Scotland in which Morrison’s competitors (for this graph I have used Asda, Tesco, Sainsbury’s, Lidl and Aldi, but other brands can easily be added into this comparison) have stores, but Morrisons are not present. The numbers along the bottom of the graph represent the number of competitor stores in these locations. But is there still room for expansion in such a crowded market? The supermarket and groceries industry continues to grow at pace, with LDC recording growth in Q1 2017 of +130 stores, compared to a net loss of -197 in Q1 2016. Whilst Morrisons have come on leaps and bounds to get where they are today, they will need to expand their coverage further to remain competitive. As their competitors continue to grow and introduce new products and services to rival Morrisons’, any part of their estate in low competition locations will come increasingly under threat as competitors move in on them. Morrisons will need to roll up their sleeves further and get competitive with their expansion. In order to do this, Morrisons should continue to expand their convenience stores aggressively across the UK. 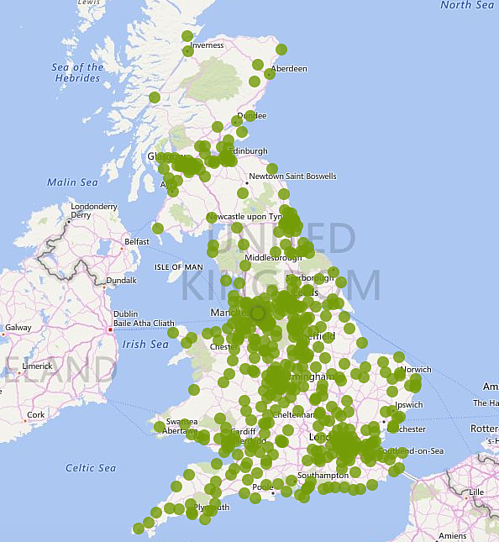 Not only is this where the new ‘space race’ is being seen, with an increase of 2,446 stores in the sector seen since 2012, but this also allows proliferation of the Morrisons brand across the country, into the areas with a low presence that were seen on the map in Figure 1. Expanding convenience stores in this way will introduce the brand to populations that may not have had access to it previously and will pick up market share overall, with less risk in the form of lower set-up and running costs for the smaller store formats. We will be releasing our annual Supermarkets, Discounters and Convenience stores report next month, which will cover the ‘Big four’ supermarkets in detail, alongside a review of discounters and convenience stores. Additional analysis on supermarkets in this report includes analysis of population density to shop numbers for GB locations, comparisons of supermarket growth to discounters’ growth and an overview of which towns are increasing numbers of convenience stores the fastest. This report is available to customers of LDC and is also available to purchase. If you would like to pre-order a copy, please email sales@localdatacompany.com.